Recommended clients in Folkstone required a large wardrobe for their amply proportioned bedroom. Approx. 108″ (2.76 m) high x 114″ (2.9m) wide x 24″ (610mm)deep, interior depth 22″ (560mm). The versatile interior allows shelving to be placed where required. The wardrobe was designed with thought to the character of the property, with similar details on door mouldings etc. The doors have hardwood mortice and tenon jointed frames with flat panels and mitred mouldings. The unit was sited directly onto the floor boards and carpet has been relaid around the base. 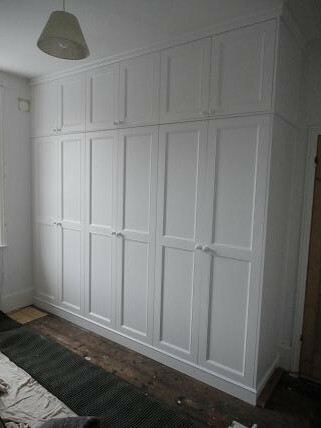 The wardrobe has been fully fitted around all walls and skirtings and scribed to the ceiling.